Last week, I posted links to slideshows of street styles in New York City during Fashion Week. This week, Fashion Week moves across the Atlantic. Here are two slideshows (1 and 2) of street styles in London. 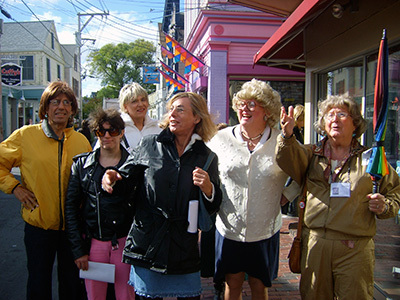 Above is a photo taken by Laurel of street styles in Provincetown during Fantasia Fair in 2008. I am really jazzed about attending Fantasia Fair next month. If I can pull it off, I will take photos of the street styles in P-Town during Fan Fair and post them here. Speaking of fashion at the fair... this year we welcome back the Master of MakeUp and Fashion Jim Bridges... who will be an integral part of this year's fashion show onstage and off! Oh, how I miss P-Town. Is the restaurant Front Street still there?